Last weekend, Diggy Raja responded to the email I sent to him a year back. That too he chose the snail mail. Yes, that's right. I received a postcard for the email! He wrote that he would allow me to interview him. He also gave me the place and time. Every month he visits a renowned psychiatrist for schizophrenia related ailments. While returning he would have some time and that's when he would answer my questions. I was glad. So I went to the clinic, showed the postcard and surprisingly was put into the van where he was sitting. He was restrained with steel chains. But he seemed to be sitting comfortably. A mark of habit perhaps. Me: Thank you very much Diggy Raja for allowing me to interview you. It is an honor. Me: I was wearing a normal brown shirt with a 'OM' symbol etched in yellow. I buttoned my jacket to hide my shirt. Me: So Diggy Sir why did you suddenly remember me now? I wrote to you a year ago. DR: That time you were under the chatrachaya(influence) of the Sangh Parivar. Now you are not. Me: I was? And now I am not? Why do you come to this conclusion? DR: Because you said that Congress has achieved a lot in your blog. Me: But I also wrote more than that. I mean did you read the whole post? DR: Of course, I see you are not yet fully cured by this new disease. Its called Namonia. Me: We have seen that your knack for defaming the Hindutvadis is slacking. Is this true? DR: What is your hobby? See, I know. I also talked about this with Shinde and he agrees too. Not only Congress people. Even Pawar has been convinced that even in the assassination of Archduke Ferdinand there was hand of Modi. No wonder they are so successful. Me: But what you are claiming makes no sense at all. The RSS or Modi were not even in existence then. DR: Oh they were there johny boy. They were just not properly named yet. Know the SS of Hitler. That was a part of the RSS. Even today RSS is a part of almost website in the world. DR: No boy...they are all the same. The same side of different coins! Anyway you look at you will find their handiwork. Who is harassing the minorities in India? RSS. Pakistan? RSS. Bangladesh? RSS. Even in Syria A(r)ssad is killing Muslims. Look at Israel. In Egypt, Russia the entire world has become a playground for fascist Hindutva. Remember how they destroyed the World Trade Center and the Masjid-e-Janmsthan? Me: Ah well(ignoring the WTC) the Babr-i-Masjid was destroyed in Narsimha Rao's regime and hence Congress also should share blame. DR: Don't make that mistake. We can and we did find scapegoats. So don't blame our secular credentials when we kills Sikhs and Hindus or Muslims etc. They don't count. Because I can't count. I mean literally. I don't know math. Me: Ah, so how do you know how many were killed by Modi? DR: I called Teesta about that. She told. She never lies. 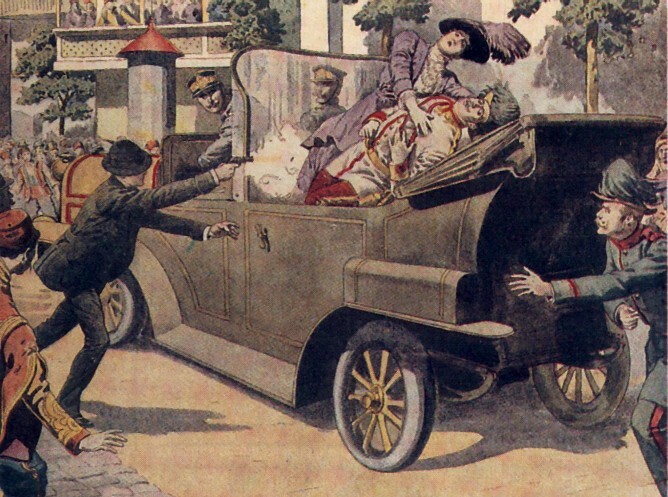 We read that Black Hand or some other underground organization shot the Archduke. But Diggy Raja says that this guy also belonged to the RSS. Me: But the court has debunked many of her claims - to put it mildly. DR: You see I was about to say that. That was because the people wielding power be it Narsimha Rao or other were hypnotized by BJP's secret weapon. Only I have unearthed it. I have not told anyone. Not even to my dogs. (The two constables sitting on either side of Diggy Raja began to grin. I looked inquisitively and they said - 'Bol bolke to dimaag kharab kar diya hain' means by constantly saying the same thing he has screwed our brain.) I quickly looked back at Diggy Raja. Me: Ok so what is this secret weapon? DR: It is a Brainwasher. It can reprogram your brain with the Hindutva virus. Once you all are infected we all are finished. It is almost like becoming zombies. Hindutvadis eat Muslims. Me: Oh so communal zombies, eh? DR: Exactly. No one has been so receptive to my ideas. They thought I can't think, so I was made to speak and made a spokesperson. But I was not to be let down so easily. I also used my brain and issued my opinions. I was fired. Suddenly on route we could hear chants of Hare Krishna. Diggy made a constipated face and remarked, "Can't these communal forces play the Azaan? Wait, next time we will make these places Secular only." Suddenly the blood pressure of Diggy Raja fell. The medical orderly was sleeping all along. He woke up suddenly. Strangely he cupped his tested hands and chanted into the ear of Diggy - "Modi is coming....Modi is coming...Modi..." in varying tones. Diggy's blood pressure increased instantly by 500%. He was given a sedative and put to sleep. Before I thought the interview was over he waved his hand making a gesture that said - "Be around, I will be back."